Germans before W W 2 didn't clearly specify the parameters used to define a light, medium or heavy tank. The Panzer 4 was not a tank !!! . In 1937, Guderian described the operational principles and tactics that would shape German thinking on how to employ armored formations in a future war. The mission of the heavy tank is primary kill enemy's tanks in counter-attacks against German breakthrough attempts. Germany need upon an heavy tank ready to counter-attack any breakthrough of the German defense lines. 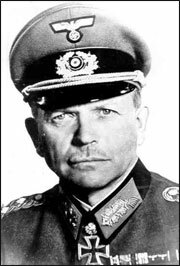 Generalinspekteur der Panzertruppen, Guderian has understood the value of Tiger as a force multiplier factor either in the offense or in the defense. After the decision to built Pz.Kpfw.III and IV, Reichskriegsministerium also called for an even heavier tank in 1937. This was to be of 30 t or more and was to be a heavy "breakthrough" tank to lead the armored assaults. He result a specification for a heavy tank capable of mounting the highly successful 88 mm high-velocity gun in a turret with full traverse and carrying sufficient armor to defeat all present and future anti-tank weapons. Two firms submitted prototypes, using some of the developments from the 1937 ideas. Only the turret was common to both and came from Krupp These were Porsche and Henschel. the Porsche prototype PzKpfw VI (VK 45.01 P) (Ausfürung P). of 5 March 1942 receive by WaPrüf 6 via th Inspekteur der Panzertruppen (In6) the designation, of Panzerkampfwagen VI P (88 mm) (SdKfz 181) Ausfürung P.
After tests conducted on 20 April 1942, the Henschel prototype was chosen for series production. Because Henschel prototype was more conventional, cheaper and easier to produce than the extravagant Porsche design. At the time of its introduction,, the Tiger was the most powerful and protect tank with his 88 mm gun, which had 92 rounds of ammunition, and the armor who ensured that any frontal shot could not penetrate. Production began slowly in August 1942. Tiger. The nominal cost of a Tiger was 250800 Reichsmarks. ( PzKpfw III Ausf. M cost 103163 RM, a PzKpfw IV Ausf. G 115,962, RM and a PzKpfw V Panther 117100 RM ) However, the final cost of the Tiger's production was even higher - around 300,000 Reichsmarks. The hull of the Tiger was a comparatively simple welded unit with a one-piece superstructure welded on top. The rolled homogeneous nickel-steel plate, electro-welded interlocking-plate construction armor had a rigorous quality control procedures ensured that it stayed that way. The armour joints were of high quality, being stepped and welded rather than riveted. Turret was also simple, and the sides were almost upright. The mantlet was very heavy, with 120 mm of armor From March 1944 on, the 25 mm roof plate was increased to 40 mm, to prevent penetration by large caliber artillery shells (over 150 mm), and the loader's hatch originally designed for the Tiger II turret was installed in the thicker turret roof. 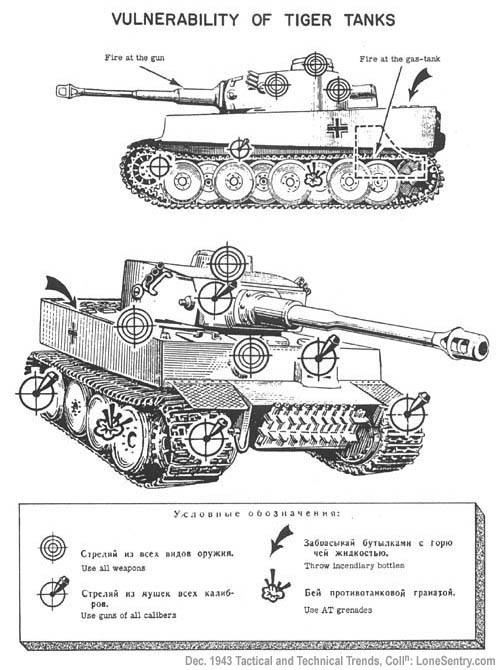 So Tiger's armor was invulnerable to attack from most tank guns firing normal armor-piercing shells or shot at ranges over 800 meters, including the American 75 mm and the Russian 76 mm. In May 1941 OKW had demanded a new Kampfwagen Kanone (Tank Gun) specification for the Tiger; to be capable of penetrating 140 mm thick armor at a range of 1,000 meters, without specifying that the caliber had to be 88mm. 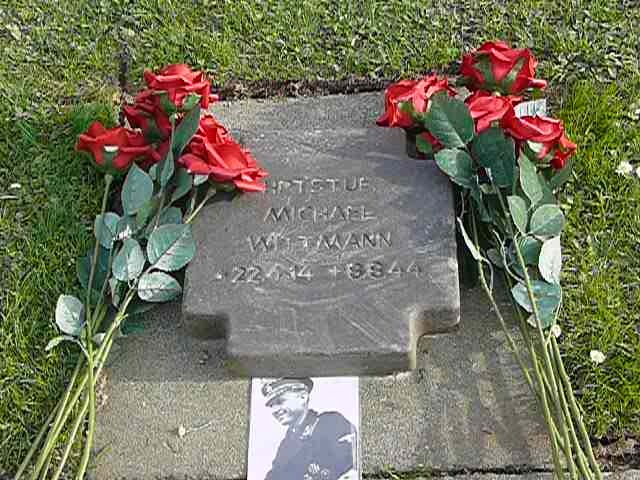 But on 26 May 1941, a Hitler's directive decide the use of a smaller but efficient caliber Rheinmetall receiving a contract in mid-July 1941 The first gun designed by Rheinmetall was , the 75mm KwK L/60, but it is only a test gun and because, Rheinmetall, was met, developed a longer gun, the 75mm KwK 42 L/70, to be fitted in a new turret, designed around this new gun. By in July 1 1942, Hitler Panzerprogramm II established that this tanks would mount with the 88mm KwK 36 L/56 in the Krupp turret. 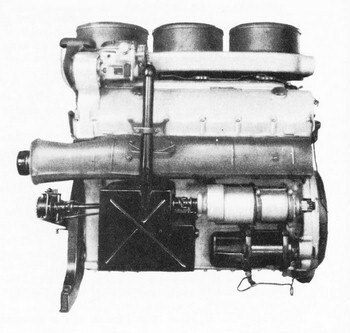 The 75mm KwK 42 L/70. 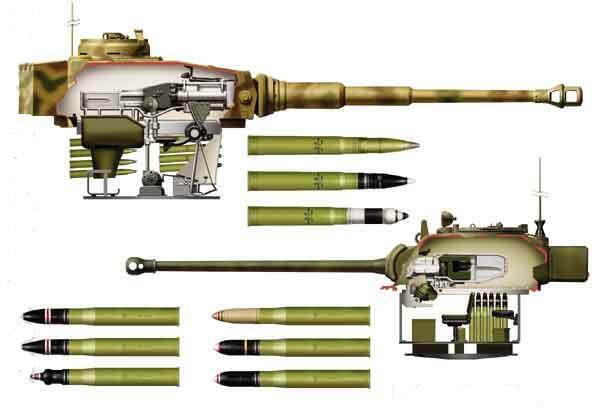 would be mounted on the PzKpfw. V Panther. On july 14 1942 at a Panzerkomission meeting it was decide to mount the 88mm KwK 36 L/56. Tiger platoons could open fire (concentrated platoon fire) for effect against stationary targets at up to 3,000 meters. The gunner observed the tracer and the strike of the round and reported his observations to the commander, who then ordered corrections.Tiger as an hydraulic motor for the turret drive. The hydraulic drive traversed the turret at a maximum rate of 360 degrees in 60 seconds, dependent on the engine speed. Placing the target on the point of a triangle allowed the gunner to aim without obstructing the view of the target. The triangle height and separation distances in mils were used as an aid in estimating the range to the target, by comparing them with the size of the target. The pattern in the right reticule also contained the 7 triangles plus adjustable range scales that allowed the gunner to register the exact range to the target. The gunner adjusted the range through this sight by lowering or raising the gun to set the aiming sight again on target. The range scale was graduated at 100 meter intervals out to a range of 3,000 meters for the Armor Piercing Composite Rigid (APCR rounds,) 4,000 meters for the APCBC (Armor Piercing Capped, Ballistic Capped) rounds, and up to 6,000 meters for the HE rounds. 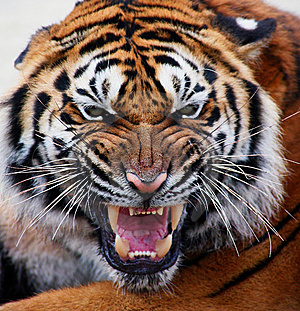 As far as the Tiger I is concerned, the two main types of armor piercing ammunition were the APCBC and the APCR. Panzergranate 39 Armor Piercing Capped, Ballistic Capped (APCBC) round relied not only on its own weight to penetrate the enemy's armor, but was also filled with high explosive that caused great internal damage. 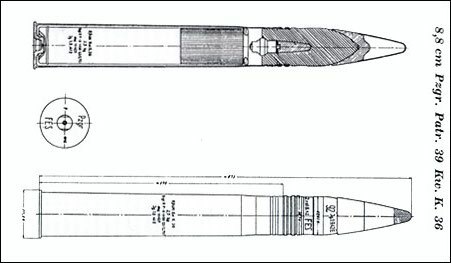 Gr.39 HL (Hohlgranate ( HEAT High Explosive Anti-Tank) was less accurate and much less destructive than the APCBC rounds, but could be carried in place of the HE rounds and used either to combat armor or as effective high explosive ammunition against soft targets. Tiger I carried 92 rounds of ammunition,with al mix(50% (Pzgr.39) and 50% Sprenggranaten - high explosive shells). 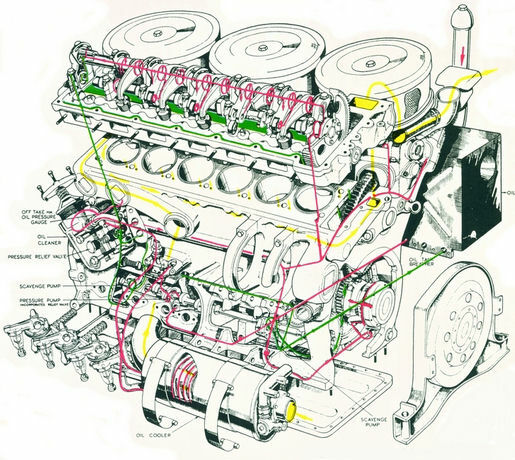 The compact engine put out tremendous power for its size. It was de 1.2m length, 0.97m width and 0.94cm height without the air cleaners. It was mounted in a sealed compartment at the rear of the Tiger. 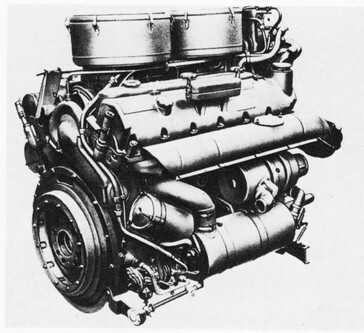 The weight of the Tiger 57 tons was too much for the German transmissions available at the time and it was not always possible to do this preventive maintenance as required so it is recommended at the driver to do not exceed 2,600 rpm. Soon it became obvious that the Tiger I was seriously underpowered. 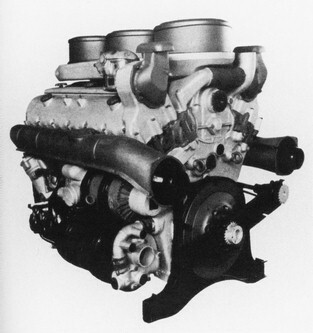 the original engines displacement was increased by replacing the aluminum cylinder block with a cast iron block and boring it out to 23.88 liters (1457 cubic ) because it was impossible to install a physically larger, more powerful motor in the engine compartment his increased the weight of the motor but also increased the rigidity. The result was a gain in power to 700bhp at 3000rpm. 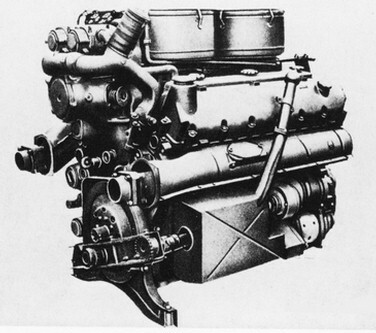 The new engine was designated the Maybach HL 230 TRM P45 with two air filters and installed in May, 1943. 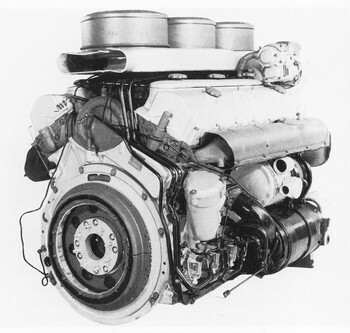 With this upgrade the Tiger's performance improved in normal use, but the transmission was still weak for the stress of the power generated by the engine moving the weight of the tank at maximum output, and preventive maintenance continued to be an imperative,. 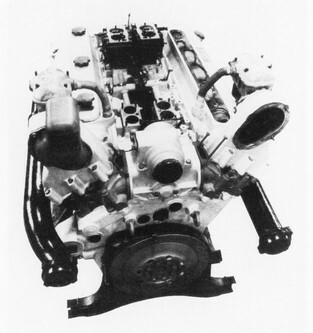 Tiger had a high fuel consumption rate of approximately 1.5 liter per kilometer. 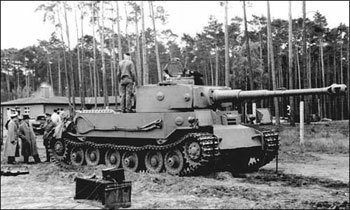 Since the total fuel capacity of the four fuel tanks was around 568 liters the operational range of a Tiger I was limited and refueling stops had to be frequent, especially when traveling off road. German logistic plans expected the Tiger to be able to travel 195km on road and 110km off road before refueling. For the speed In comparable to other German tanks of the time, it run at the same speed than the other german tank The Tiger I road speed was 38 km/h. Cross country speed was 20 km/h. In comparison the Panzer IV road speed was 40 km/h. Cross country speed was 20 km/h and thee Panzer III (Ausf E to N) road speed was 40 km/h. Cross country speed was 18 km/h The only german tank that was faster than the Tiger I was the Panther, with a road speed of 46 km/h and a cross country speed of 24 km/h. Bat he was still slower than many of its adversaries, such as the Russian T34. 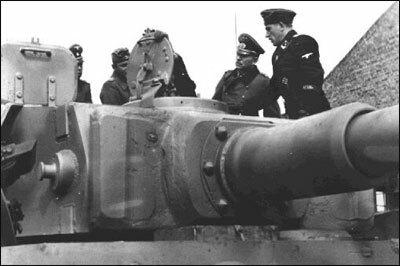 To support the heavy weight of the Tiger, the tracks were an unprecedented 725 mm wide. To meet rail-freight size restrictions, the outer row of wheels had to be removed and special 520 mm wide transport tracks installed. With a good crew, a track change took 20 minutes. To resume Tiger was not a "lumbering monster", and he was superior to the Sherman in muddy terrain, despite its size and weight, thank to his ground pressure The Tiger I was a very maneuverable tank, especially for its weight and size, but had its shortcomings. The necessity to change tracks for rail travel was one of those. Presence of feifel air cleaners the rear. Commanders cupola with the vertically opening hatch. New cupola with side-swinging hatch. Feifel pull out on December '43 or later. Hull extensions on the front where the tow cables attach. These were notched beginning in January 1944. As the Tiger was a Mighty MBT with a battlefield superiority he was constantly transferred from one point to the other on the battlefield - and even front to front - as "fire brigades". So to save the potential of this MBY he was choose for great distances the rail. But in 1943 Germans have lost the air superiority and convoys were submit to air attack. This eventually limited transportation of Tigers by rail to the night. 4 and 6 axle flat cars SSys & SSyms "Koln"
In the beginning ofWW2 German army need for flat wagons with a high load capacity. Especially for this purpose were the 4-axle wagons of the type Koln developed with the aim of heavy military vehicles and other heavy loads to move quickly to the different parts to the front. 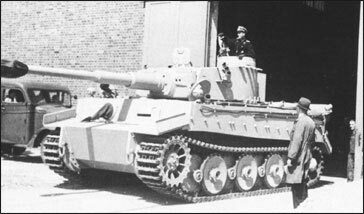 But Tiger, however, was to wide, it had some modifications before such a pre-shipment be used. 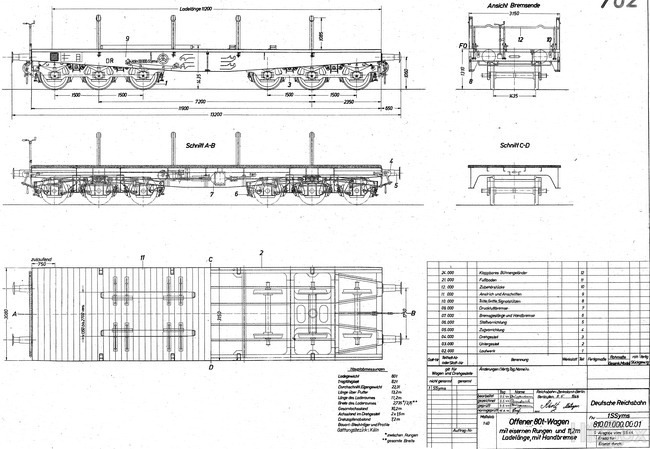 the mud on the side skirts were removed and he could be use over tracks for the travels on railway (Width 520 mm / Combat Chain 725 mm). If a long distance was to be covered, it was customary that the tank crews bivouac with their tents or behind the tanks on the trucks, upon the wagon. SSys : 4-axle flat wagon type SSys "Koln". SSyms: 6-axle flat wagon type SSyms "Koln". Tigers gearbox need adequate periodic maintenance but she never received this maintenance. So it usually resulted in a low operational rate of combat available tanks within the Schwere Panzer Abteilung - especially after long marches or extended periods of combat. The outcome was low operational mobility as a result of those problems, which meant that Tiger units frequently had a very limited radius of action. Absence of special recovery vehicles, was a problem to recovery this Tiger and it is prohibit at a tiger to tow other broken tanks. The legend of the Tiger was overrated ? 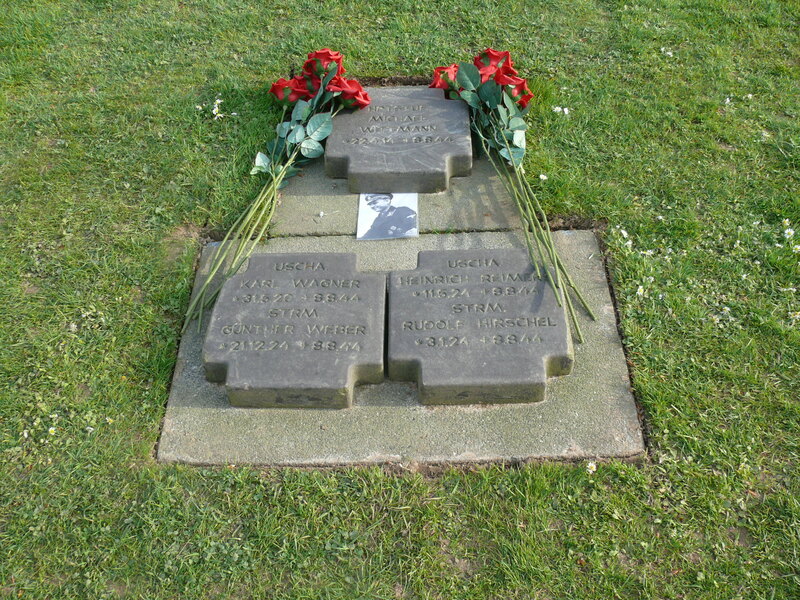 Because : Tiger could choose its targets at will, and destroy them at ranges they either couldn't hit; or if they could hit, couldn't defeat the Tiger's thick armor but if he was a tremendous weapon , Tiger I maintained this standoff capability until nearly the end of the war, as it was only outclassed by the Russian JS heavy tank. If they were not recovered, they were destroyed by their crews. The introduction of the Panzerkampfwagen Tiger Ausf.E heavy tank provided improvement in the German armored formationsthe Tiger was assigned to special heavy tank battalions (schwere Panzer Abteilungen - sPzAbt). These were to be held at army or corps level and assigned as needed to reinforce other units during a campaign. Only a few divisions ever received organic Tiger battalions. These included Panzergrenadier Division Großdeutschland and Panzer Lehr Division. Prior to the Tiger's introduction, and lacking a true heavy tank, the Germans used the PzKpfw IV with a low velocity 75 mm main gun to fulfill the heavy tank role within the medium tank companies though Poland, France, and during Operation Barbarossa in June 1941. Until the German armored forces encountered Soviet heavy tanks, such as the KV I, KV II, and the T-34/76, the PzKpfw IV was sufficiently well armored and armed to meet the tactical demands of a heavy tank. The appearance of the T-34/76, specifically, greatly influenced and decisively accelerated German heavy tank development. The German Army needed a heavy tank with more armor and a larger main gun capable of penetrating the sloped armor of the T-34 The Panzerkampfwagen Tiger Ausf.E was the weapons system developed to meet those and future threats on the battlefield, and the schwere Panzer Abteilungen the organization that took form to meet these requirements. 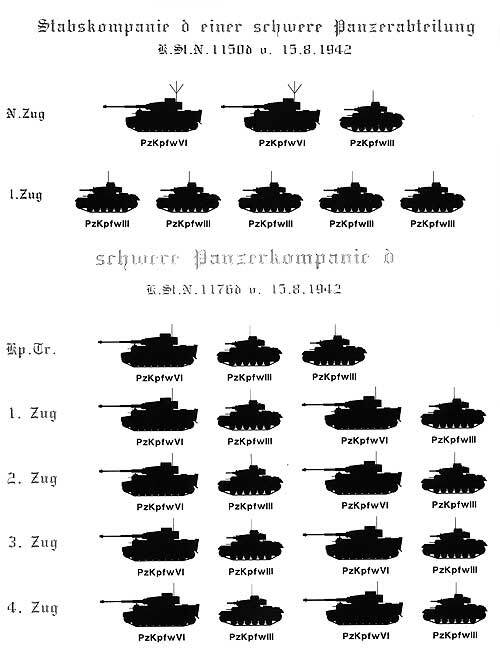 As originally conceived, the schwere Panzer-Kompanien (heavy tank companies) were organized as three Zuege (platoons) each with three Pz.Kpfw.Tiger Ausf.E for a total of nine heavy tanks. 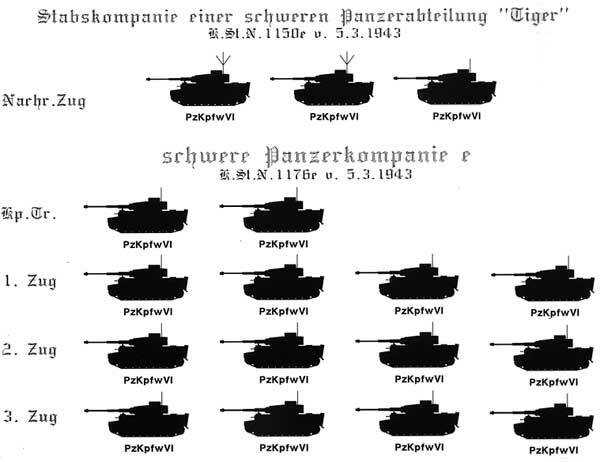 Later the organization was expanded to include 10 Pz.Kpfw.III along with the 9 Tigers to compose one schwere Panzer-Kompanie. The first three units send into the field (schwere Panzer-Abteilung 501, 502, and 503) experimented with practically every possible combination of Pz.Kpfw.III and Tigers within their schwere Panzer-Kompanien. Tiger was see first in action on September 22nd 1942 near Leningrad One tank was captured largely intact, which gave the Soviets a chance to study the tank and prepare a response. Lenino-Snegiri In very bad condition. A former badly shot and cut up firing range target. An outdoor exhibit and subject to frequent vandalization.